Find a silk button-down blouse and tuck it into a pair of light denim jeans or pencil skirt, like this one from Banana Republic. When accessorizing soft hues of blue, consider jewelry that will pop against the color and accentuate your best features. This large, gold-linked necklace from H&M is great because it lies flat on your neckline – without adding a lot of bulk – and looks super-luxe when it peeks out from underneath a collar. Throw in a pair of reflective sunnies to block out the glare and elevate your look from casual-cool to effortlessly chic. 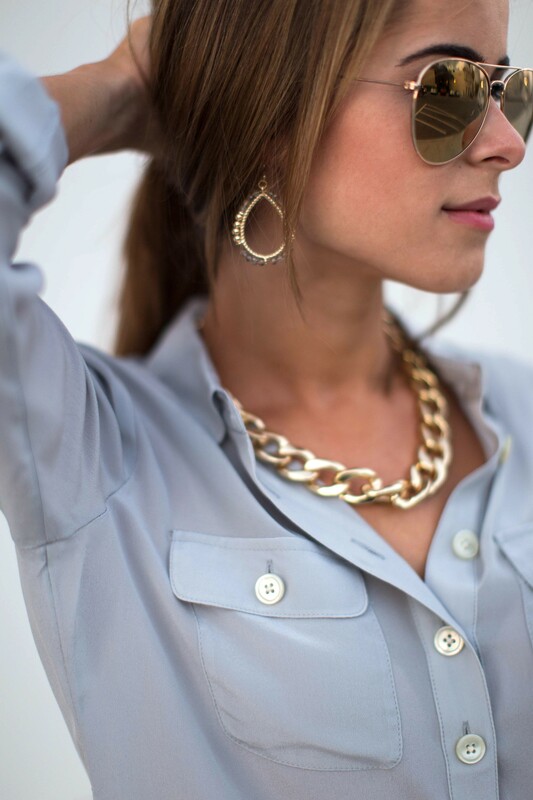 Love the Banana Republic pastel color shirt, with the jewlery as an accent. The denim looks fab! Casual chic. The shades really pull the whole look together. Amazing! Can’t wait to see what you have in mind for guys’ fashion! !